Monotype is a one-of-a-kind printing technique where no two prints are alike. Images can be similar, but exact editioning is not possible. The appeal of the monotype lies in the unique translucency that creates a quality of light very different from a painting on paper or a print, and the beauty of this media is also in its spontaneity and its combination of printmaking, painting and drawing mediums. 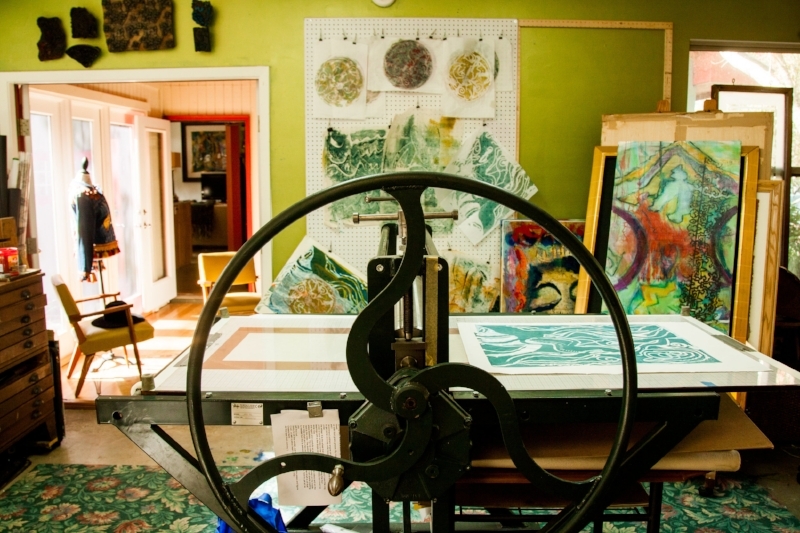 Monoprint: The process of monoprinting and monotype printing is similar: the artist applies color directly onto a surface and then prints it running it under an etching press. Monoprints differ in that they have an impression that can be repeated. Artists may use etched plates or some kind of pattern such as lace, leaves, fabric or even rubber gaskets, to add texture. Chine-collé is a special technique in printmaking in which a paper surface is bonded to a heavier paper for support in the printing process, resulting in a collaged look. Intaglio is a basic printmaking technique involving an incised image into a surface. Plexiglass, copper or zinc plates are used as a surface, and the incisions are created by etching, engraving, dry-point, or mezzotint. To print an intaglio plate, the surface is covered in ink, and then rubbed vigorously to remove the ink from the surface, leaving it only in the incisions. A damp piece of paper is placed on top, and the plate and paper are run through a printing press. The pressure results in a transferred image from the ink from the recesses of the plate to the paper. Etching is also considered an intaglio process.